There’s something about nice weather that makes me want banana bread. And since Summer has been giving us Norn Iron ones a sneak peek of this year’s collection of rays, I decided to get those bananas mashed (sounds lovely, eh?)! This is one of my favourite recipes that I use time and time again – a little like the chocolate batter I blogged about last month, it works well in various forms. I love a good loaf to slice away at over a lazy weekend, but I also love sharing banana muffins with friends. 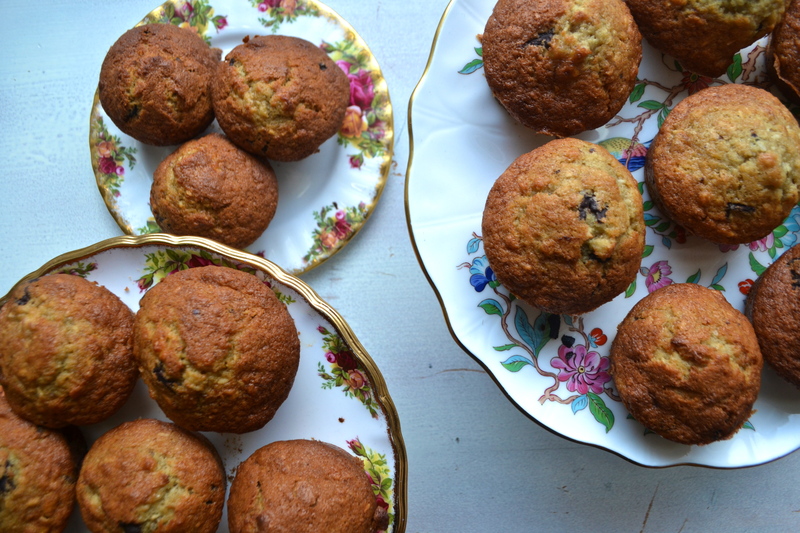 We’re doing some visiting and entertaining this weekend, so I’ve gone for muffins: if you make a loaf, bake it for 10 minutes longer than this recipe calls for. Combine 2 cups local self-raising flour, 3/4 tsp baking soda, 1/2 tsp salt. In a larger bowl, blend 1/4 cup local unsalted butter and 1 cup Fairtrade granulated sugar (I use a mix of caster and muscovado). Add 2 local eggs, one by one, stirring the mixture as you do. To this, add 1 & 1/2 cups mashed Fairtrade banana, 1/2 cup local skimmed milk and 1tsp vanilla extract – I love the stuff with seeds. Add the flour mixture from earlier. Add to this whatever little quirk you want to give to your banana bread. My favourites are blueberries, chocolate chips, hazelnuts & coconut. But really; whatever tickles your fancy! I’m off to enjoy a banana muffin. Let me know how you get on!